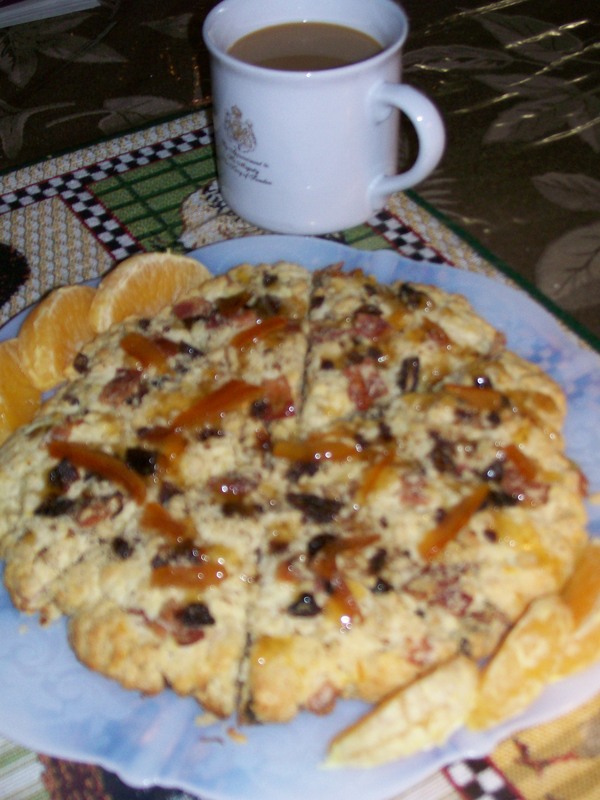 A very close friend of mine who happens to be English, first intoduced me to scones, which she bakes frequently. A visit to her home for “a cuppa’ always included freshly baked scones, warm from the oven, and falling apart tender. They were served with some of her homemade jam and butter. These were as comforting as comfort food can get. I made myself a promise that I would learn to bake scones, too; and I did. 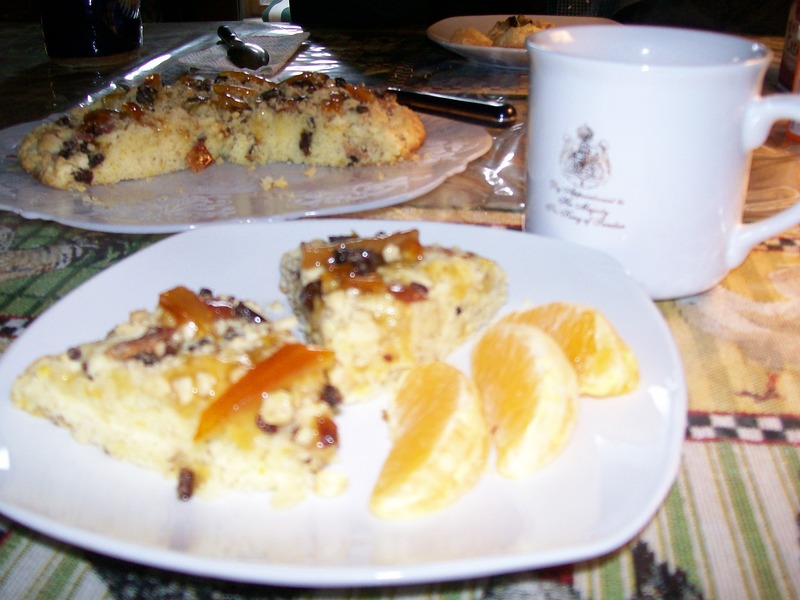 The sweetness of dates coupled with the smokey saltiness of bacon and hint of orange work so well together. I’m sure you will want to try them. They are very easy to make, but as with all scones, remember to handle the dough as minimally as possible for the most tender outcome. Preheat oven to 400 degrees. Line 2 cookie sheets with parchment paper, or spray with no-stick cooking spray. In a large bowl, combine flour, sugar, orange zest and baking powder; mix well. Using pastry blender or fork, cut in 6 tablespoons butter until mixture looks like coarse crumbs. In a small bowl, stir together bacon, dates and nuts. Stir 1 cup of this mixture into the flour mixture; set aside the remaining bacon mixture. Make a well in center of flour mixture. In another small bowl, lightly beat cream and egg together with wire whisk. Pour into well of flour mixture. Stir with fork until flour mixture is moistened. Gently form into 2 balls. Place one ball on each cookie sheet, and pat them into 8-inch rounds. Using a knife dipped into flour, cut each round into 8 wedges; do not separate. 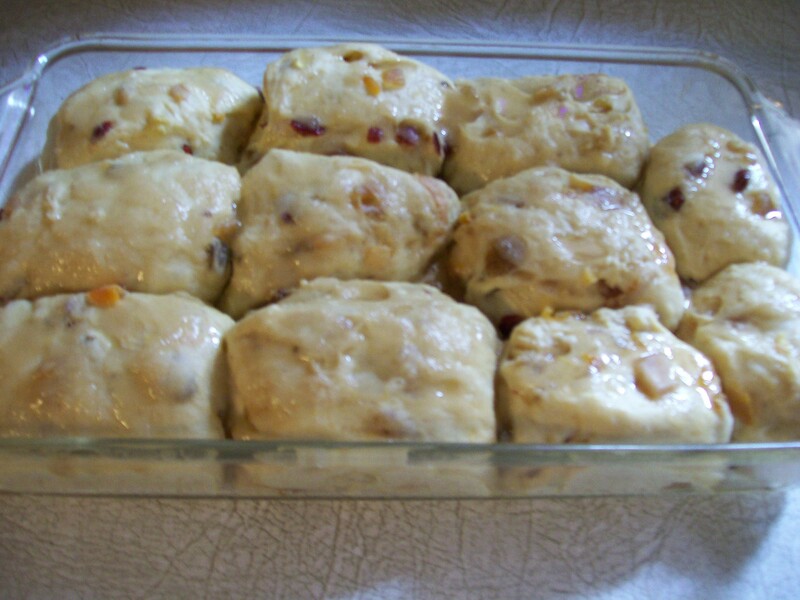 Sprinkle top of each round with remaining bacon mixture, pressing lightly into dough. In small microwavable bowl, microwave glaze ingredients on High 20 – 30 seconds or until melted, stirring until smooth. Spread glaze evenly over the 2 rounds. Carefully separate into 16 wedges. Serve warm. Store any leftovers tightly covered. May be reheated in microwave briefly to enjoy later. I’m not much on Blondies. Chocolate is always my first choice in desserts of any kind. However I came across this recipe a short time ago, and just had to try it, mainly because of the addition of salt on top. Salt and caramel, salt and butterscotch; this combination a getting a lot of attention lately. After making these squares, I can definitely see why. To sum it up in one word: HEAVENLY! OK people, I’ll try to be more specific. They are chewy, buttery, melt in your mouth, and can’t-wait-for-another-one-good. The addition of that little bit of salt on top is a suprise, yet seems so right paired with the sweetness of the butterscotch. If, for dietary reasons you need to leave off the salt, these squares will still be wonderful, so don’t let that stop you from making them. Without further ado, here is the recipe. Preheat oven to 350 degrees. 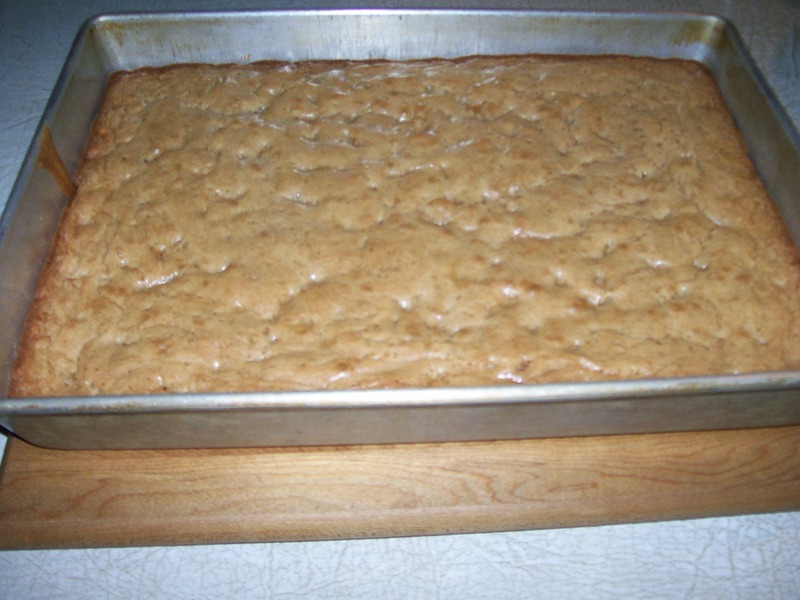 Grease well a 9 x 13 inch baking pan. Melt butter and pour into a large mixing bowl. Stir in brown sugar, Kosher salt, baking powder vanilla and butter flavorings. Mix until well combined. Stir in flour and mix well, then the lightly beaten eggs. Stir until thoroughly combined. Lastly stir in the butterscotch chips. Pour batter into prepared pan, spreading evenly. Sprinkle sea salt on top. Bake for 30-35 minutes until golden and edges are a little brown. Do not overbake! Cool completely before cutting into squares. 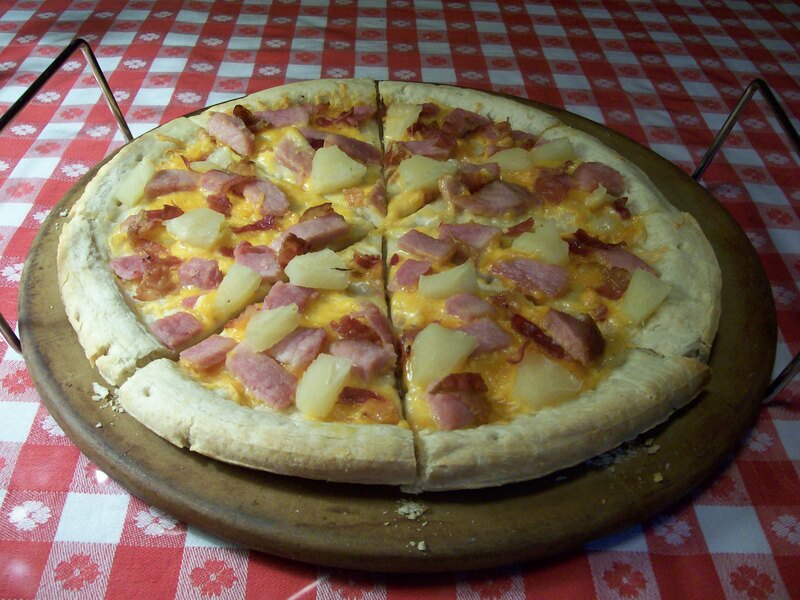 This is a wonderful one-dish meal that I came across several years ago. I prepare if rather often, because it is easy, very tasty, and makes enough for a second meal. The ingredients are ones you probably already have in your storage pantry. It contains all the food groups recommended for a well-balanced meal, especially if served with a side salad and a crusty bread to soak up all the juices. I have served this entree when I entertain, and people always comment on the tender chicken and flavorful beans. Any leftovers reheated seem to taste even better because all the seasonings have more time to “marry’. 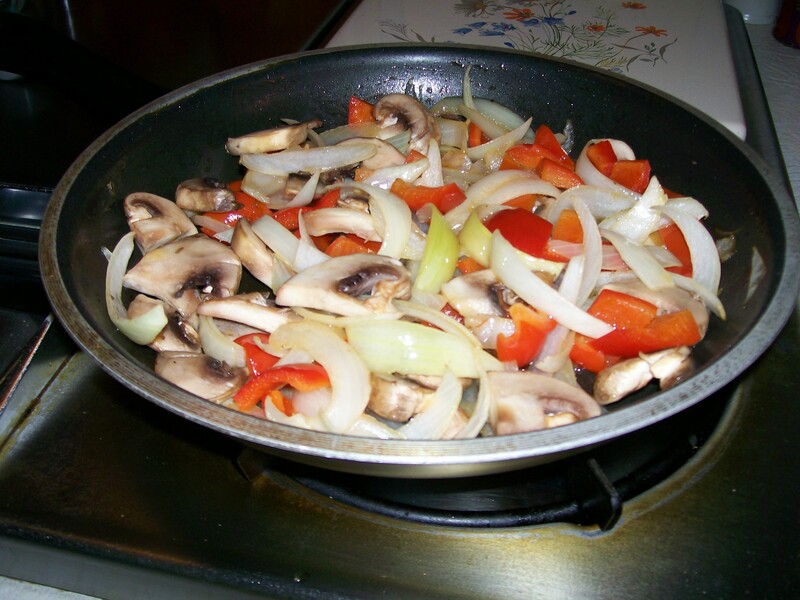 In a large skillet, brown the chicken in oil, a few pieces at a time. Do not crowd the pan as the chicken will not brown nicely. Remove to a platter and set aside. Saute onion and garlic in drippings remaining in skillet until transparent. Stir in remaining ingredients. Spoon into a large baking dish. Arrange chicken pieces on top. Cover and bake at 350 degrees for 65-75 minutes or until chicken juices run clear. 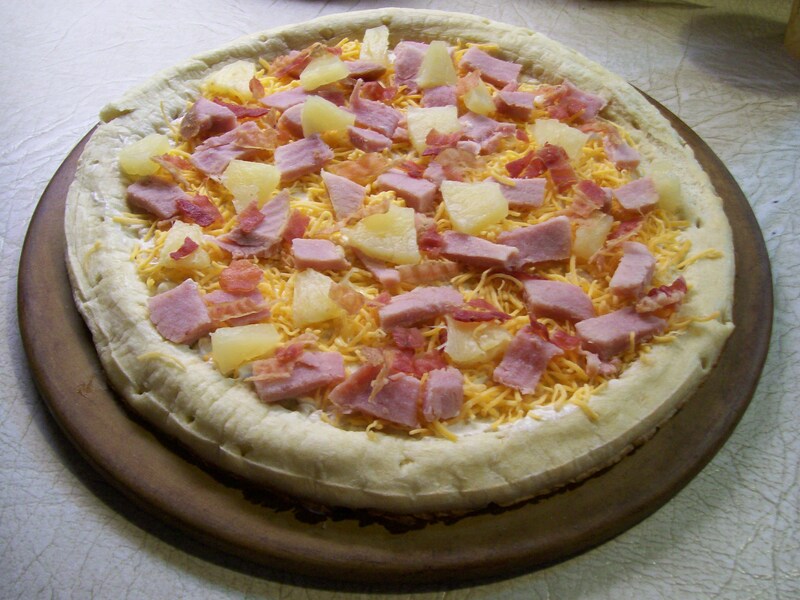 With this easy and delicious recipe, pizza will quickly become an often-served meal in your home. If you prefer, you can replace the whole wheat flour with regular bread flour. I depend on my bread machine to make my yeast doughs, but of course you can make it in the traditional mix and knead method if you prefer. 1. Place ingredients in pan of dough machine in the order recommended by your machine. 2. Set for DOUGH cycle, and press START. 3. 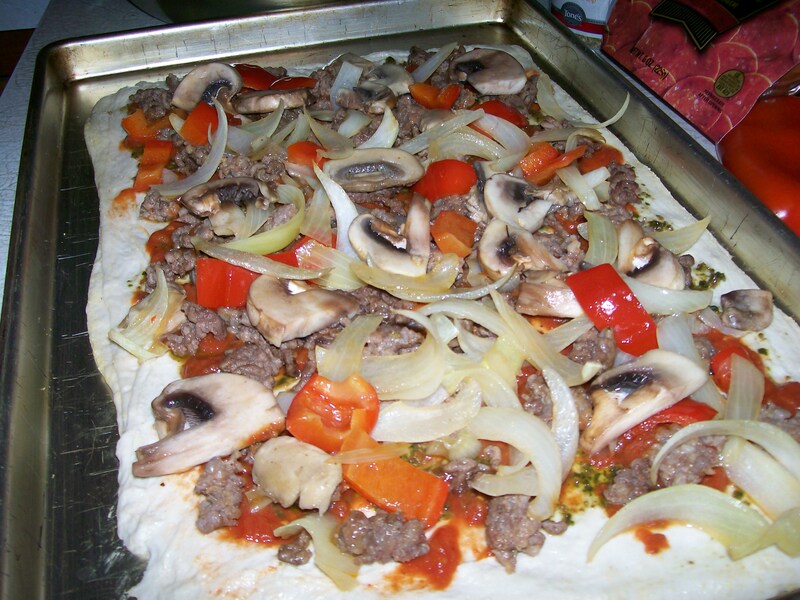 At end of cycle, remove dough from the machine and roll into 1 or 2 pizza pan-sized circles. 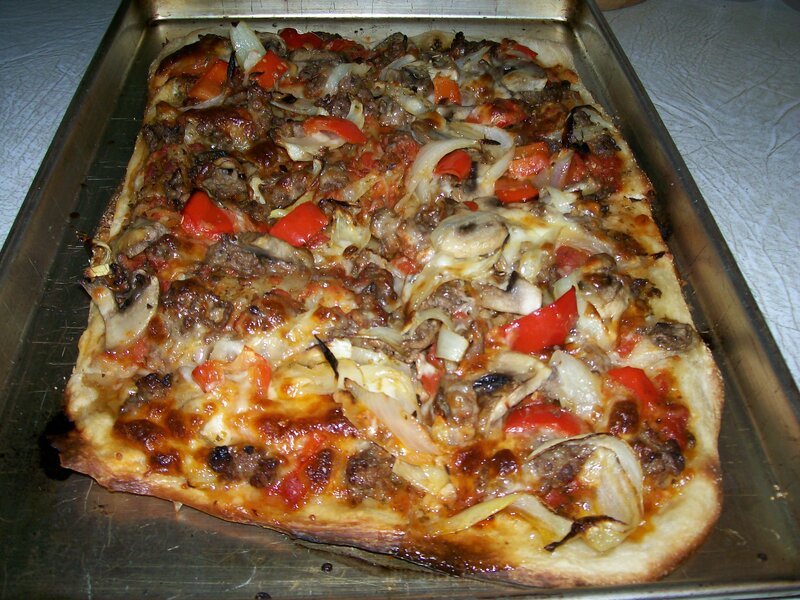 Place on lightly oiled pizza pan and turn any excess dough under itself to form a high crust. Cover and let rise for about 30 minutes. 4. 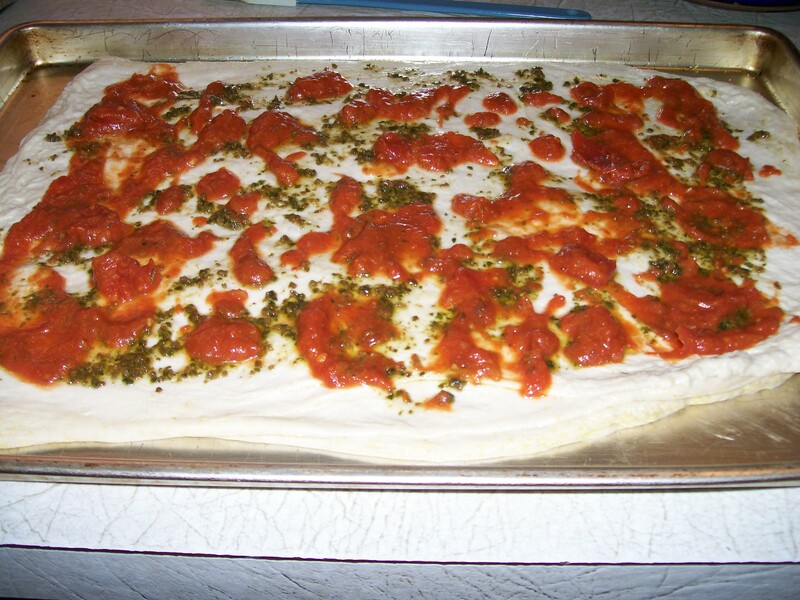 Spread with desired sauce and toppings. 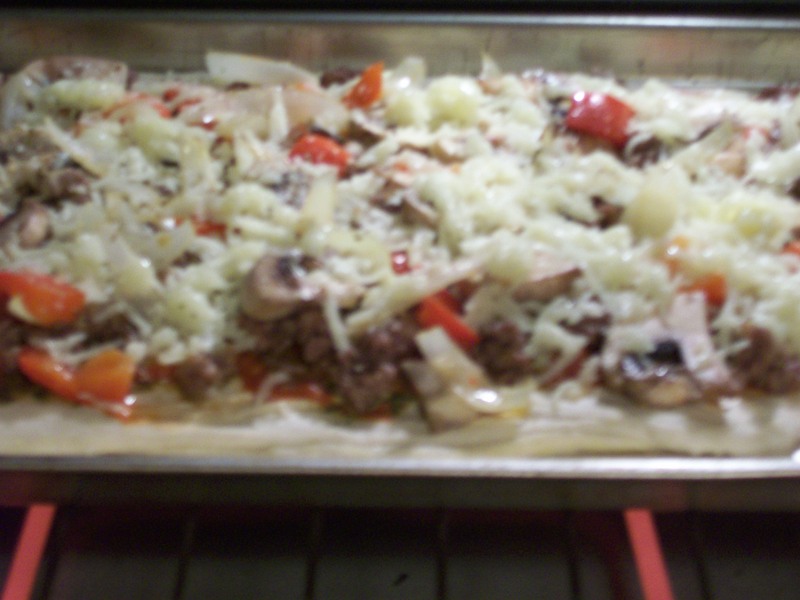 Place in preheated 400 degree oven and bake for 25-30 minutes. 5. Alternately, you may divide the dough into 2 balls, wrap in plastic wrap and foil, and freeze for later use. Most of us eat bread in some form every day. Breakfast: toast; Lunch: a sandwich; Dinner: rolls or bread of some kind. If so much of your daily intake is devoted to one kind of food, then shouldn’t it be nutritiously good for you as well as tasty? I believe that the answer to that question is definitely YES. If you agree with me, then you might want to give this recipe for Molasses Wheat Bread with Raisins a try. In developing this recipe, my goal was to incorporate as many high fiber ingredients as I could and add some sweetness, without a lot of sugar. Using a bread machine makes it easy and quick. While the machine is doing all the work for you, you can be doing other things…multi-tasking at its best. Of course, you may also put the ingredients together in a large mixing bowl, and make the bread in the traditional way. The children in my family are very fond of this bread. They call it “Nan’s Lassis Bread”, and love it toasted with a spread of peanut butter. Considering the high quality carbohydrates, and protein in this duo, you only need to add a piece of fruit for a complete breakfast, or lunch. This recipe makes a 1 1/2 pound loaf. Set your machine for ‘sweet” cycle. Put the ingredients in the baking pan in the order recommended by your machine and press START. 1/2 cup raisins. Add these slowly, about half way through the mixing cycle, allowing the machine to incorporate them into the dough. Your house will smell wonderful while this is baking! I find it hard to resist having the end piece spread with a little butter while it is still warm. YUM! I grew up enjoying all the wonderful things my mother baked using yeast. 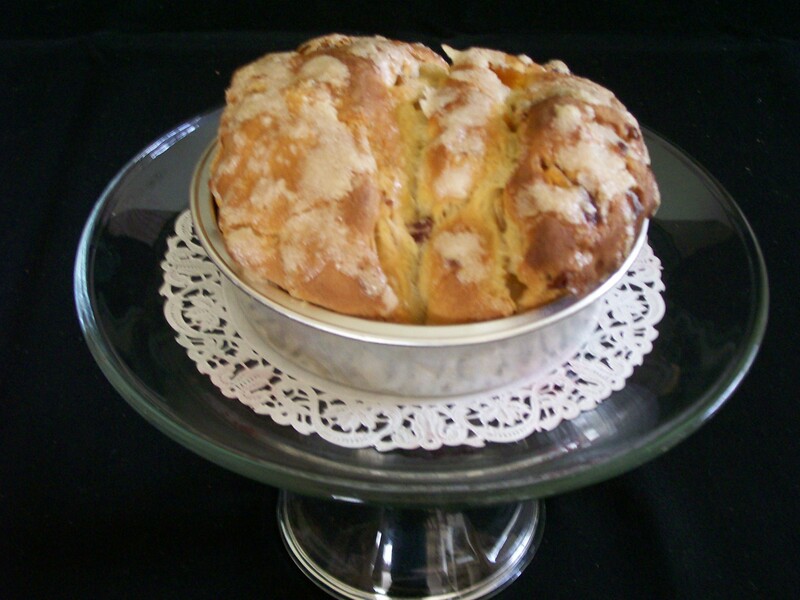 At Easter it was hot-cross buns, and Limpa bread, Thanksgiving called for her dinner rolls, Christmas meant stollen and sweet breads. At other times we had cardamom bread, pizza, cinnamon raisin bread, and the list goes on and on. My Mom was the one who always baked yeast items for bake sales, or to give as gifts. Her fingers understood what the dough should feel like when it was “right”, and for her to do this was no big deal. Unfortunately she did not teach me! 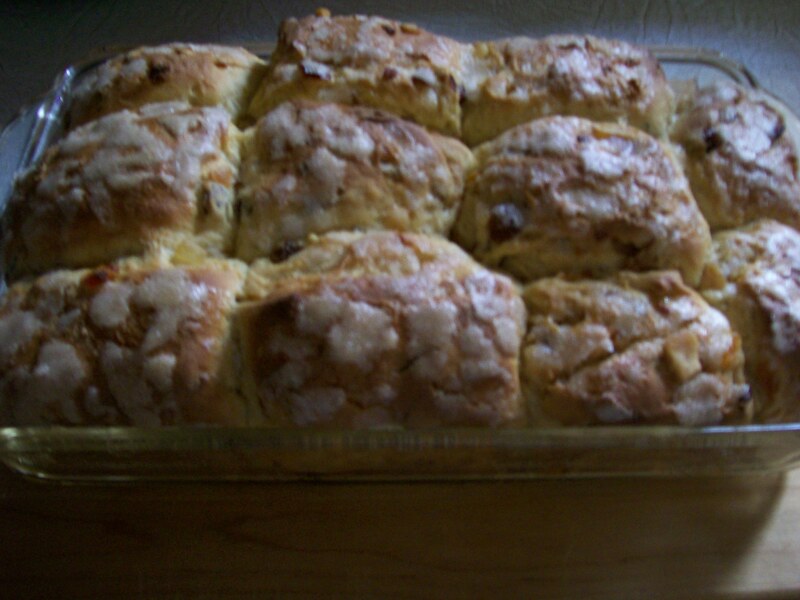 When I was a young mom with three small children, I decided one day that I would make raisin bread. I had no problem with assembling and mixing all the ingredients, smooth sailing so far. Now came time for the dough to rise. I recalled my mother setting her bowl of dough over a pan of hot water and covering it with a towel. Magically it rose nice and high, so I did the same thing. After about an hour I checked it, but my dough hadn’t risen, not the tiniest bit … then I realized I had left the heat turned on under the pan, and the water in the pan was boiling. I think I cooked the yeast before it had a chance to grow. Well, throw that one away! Undefeated, I tried again. This time, to raise the dough, I covered it and put it in a preheated 200 degree oven. I know what you’re thinking here, but yes, I did turn off the oven, and waited for 1 & 1/2 hours. When I checked my dough it had risen … a little. So feeling successful, I put it in a bread pan and baked as directed. 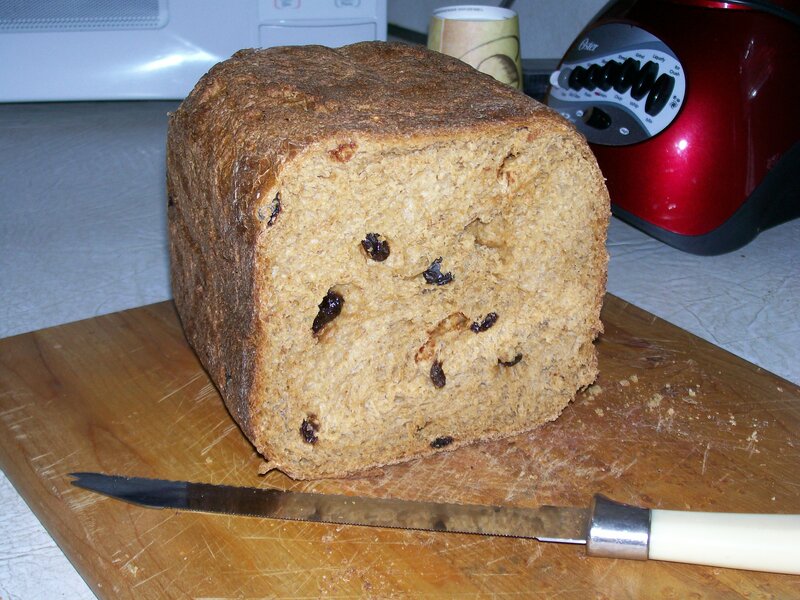 The resulting loaf of bread was small, hard, and tough with little bits of charcoal in it that once had been the raisins. OK, that was it for me. No more baking with yeast, I’ll just focus on all the other kinds of baked goods, and be really good at those. For years that’s what I did, UNTIL I learned about bread machines. The next year I got one for Christmas, and that was the turning point for me. No more fear of yeast after that. I use my bread machine to mix and bake breads, or use just the dough cycle to mix and raise the dough, after which I remove it, shape, fill, roll or whatever, and bake. Success at last. 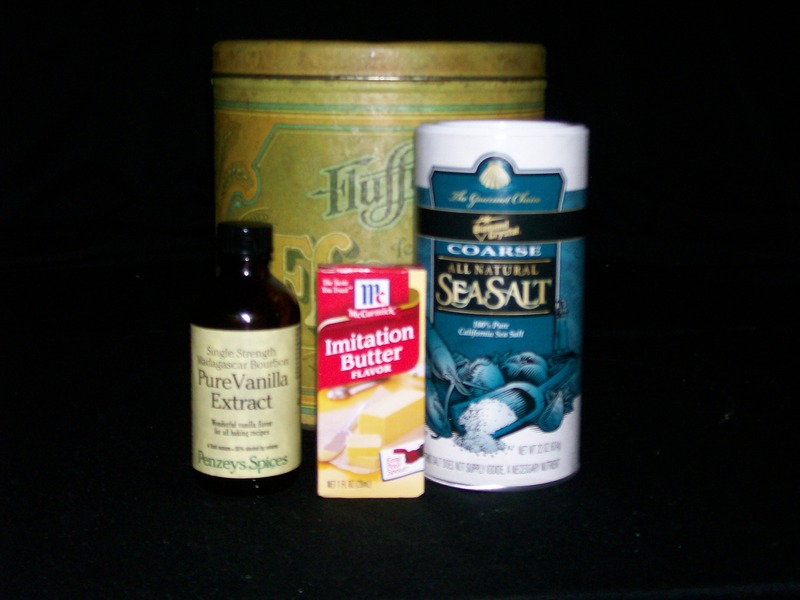 The recipe I have for you today comes from my Mother’s recipe box. 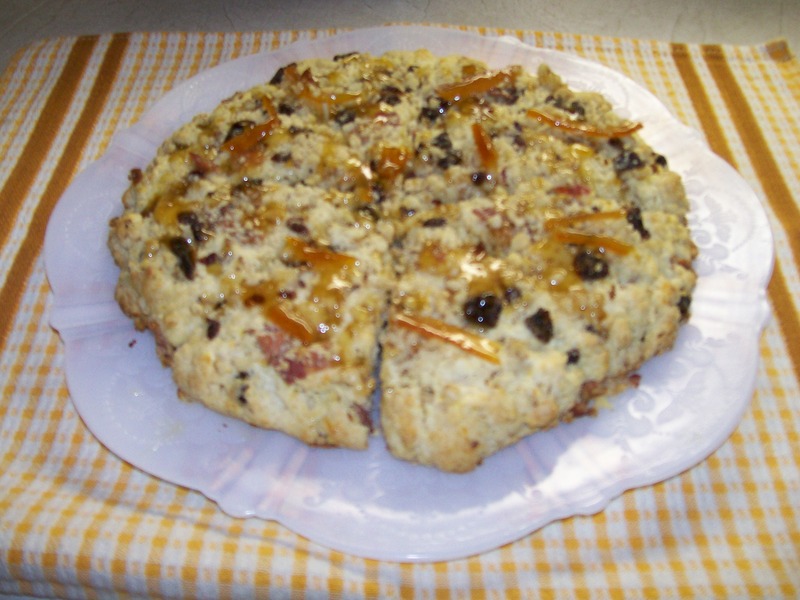 It is for a sweet dough, and my favorite way to enjoy it is with dried fruits added. 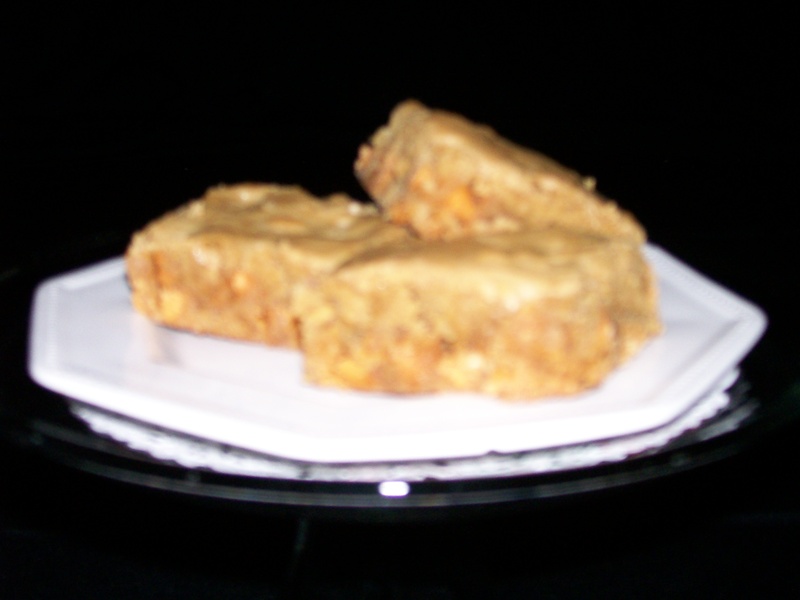 I made a few adaptations to the recipe to bring it up to date with today’s dietary life style. 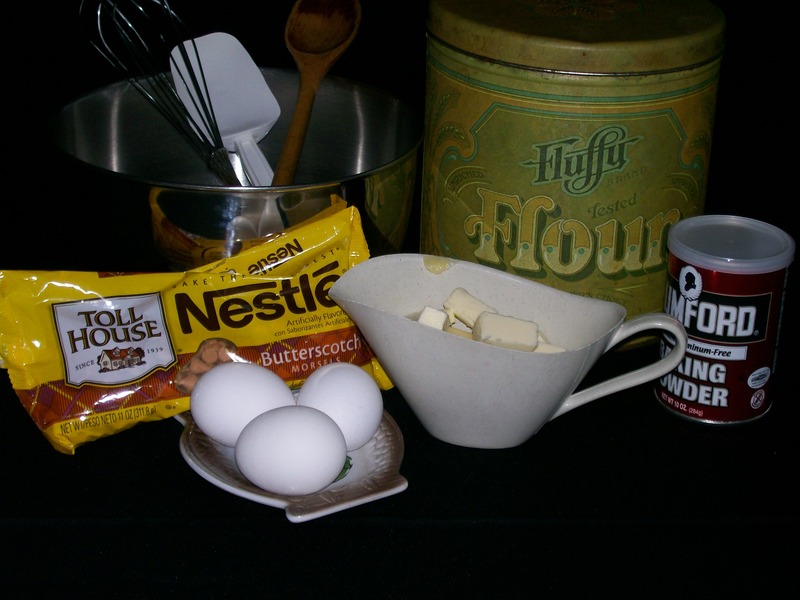 Mix these ingredients together in a small bowl. Cover and let rest at room temperature overnight. Mixture will become bubbly. Put all the dough ingredients in the pan of a bread machine in the order recommended by your machine. 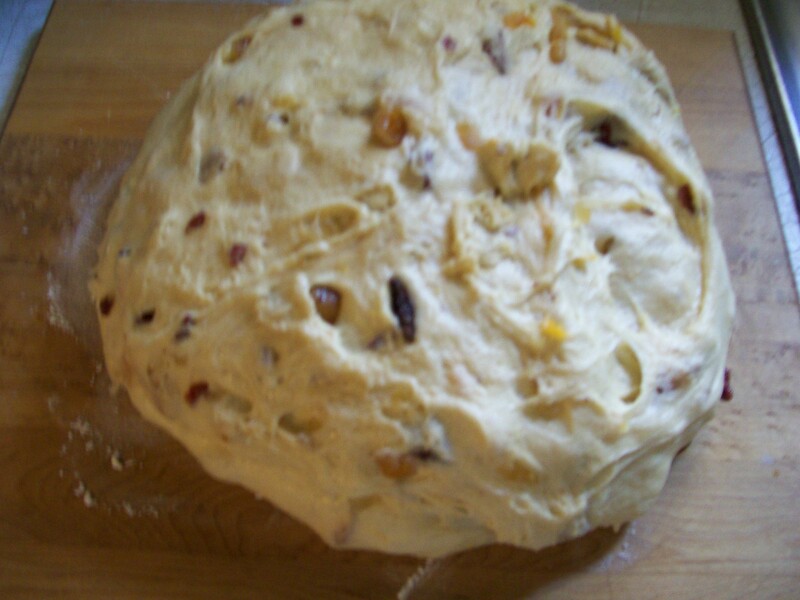 About half way through the mixing , add the dried fruits slowly, allowing the machine to incorporate them into the dough. Let the machine progress through to the end of the dough cycle, when the dough will be significantly puffed, but may not be doubled. Remove dough to a kneading surface, and gently deflate. Divide it into 12 equal size balls. Place them into a greased 9″ x13″ pan. Cover and let rise for 1 hour at room temperature. Preheat oven to 350 degrees. 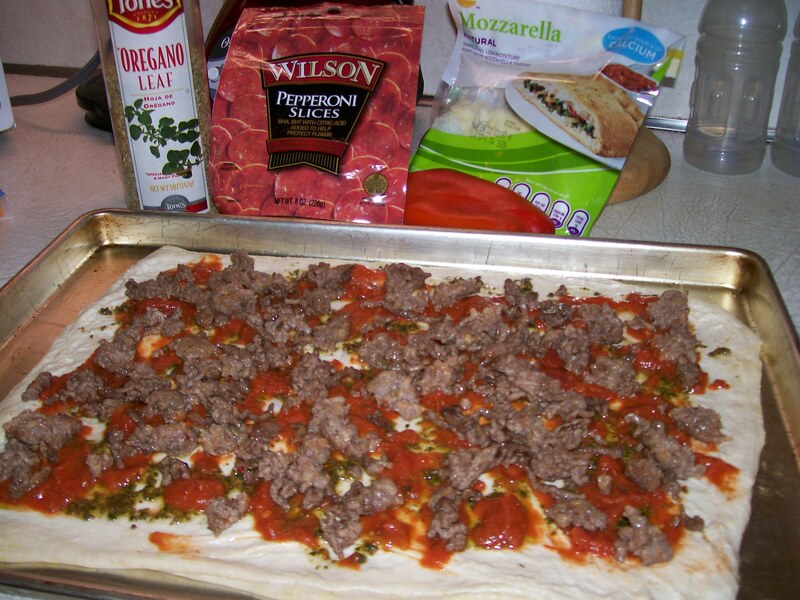 Mix together topping ingredients until syrupy, then drizzle over the dough. Bake for 35 to 45 minutes until golden brown. Baking time depends on size of dough balls, so start checking for doneness at 35 minutes and add a minute or two as needed till done. NOTE: Be sure to eat at least one while still warm! 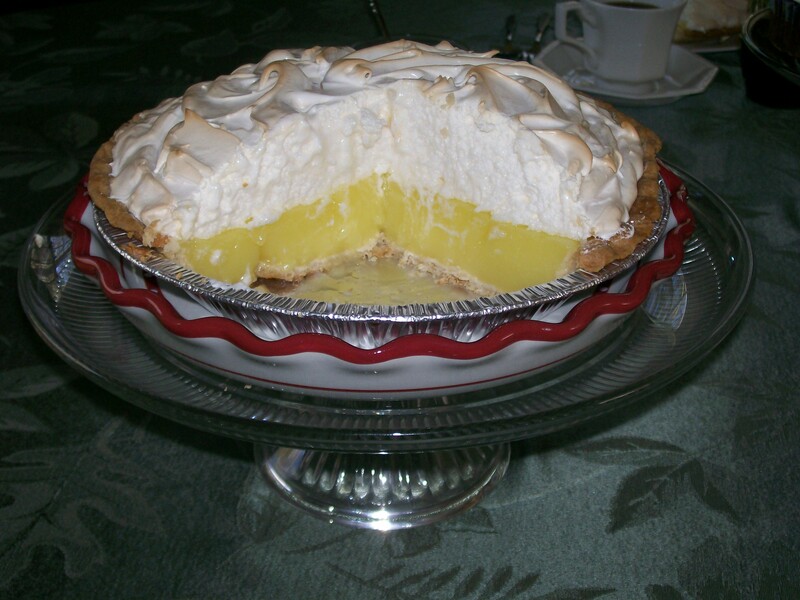 I always associate lemon meringue pie with Easter, but in the past whenever I made one, I was always dissatisfied for one reason or another. 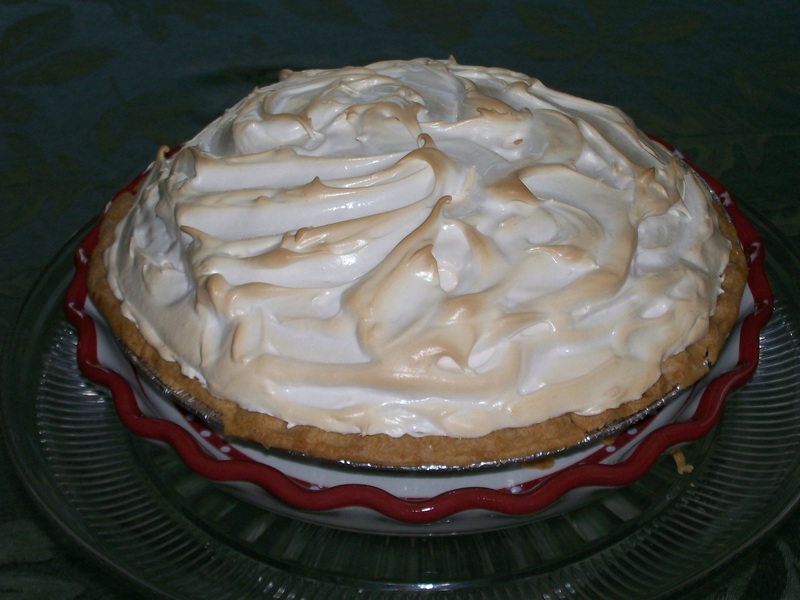 Either the filling didn’t set up well, or the meringue was “weepy”, the crust got soggy, and any leftover pie turned to liquid. Alas, I gave up and turned to lemon squares instead. This year was different! I made a lemon meringue pie that was perfect in every way. Everyone said so! How, you ask? In one of my many food related magazines, I read a tip about how to get a stable meringue that whips up really stiff and doesn’t deflate. The secret is Marshmallow Cream added to the egg whites. 1 prebaked 9″pie shell, or graham cracker crust. In a medium saucepan, slightly whisk the egg yolks. Whisk in the sugar, cornstarch, salt, pineapple and lemon juices. Combine thoroughly. Place on medium heat, stirring gently, but constantly, until mixture comes to a simmer. Add butter and boiling water; continue heating, stirring, until thickened and bubbling. Remove from heat and pour into prepared pie crust. Preheat oven to 400 degrees. Whip egg whites in a large grease-free bowl with an electric mixer until white and foamy. Add marshmallow cream; whip until very fluffy. Spread onto pie, making sure to touch all edges of crust to seal. Using a knife or spatula, create swirls and peaks for a pretty texture. Bake until lightly browned on top, about 5 minutes. Allow to cool, then chill at least 2 hours before serving.